Personally, I hate doing chores. If someone paid me to do chores I don’t think it would make me any more likely to do them. Sadly, chores are a necessary, if annoying, part of life. 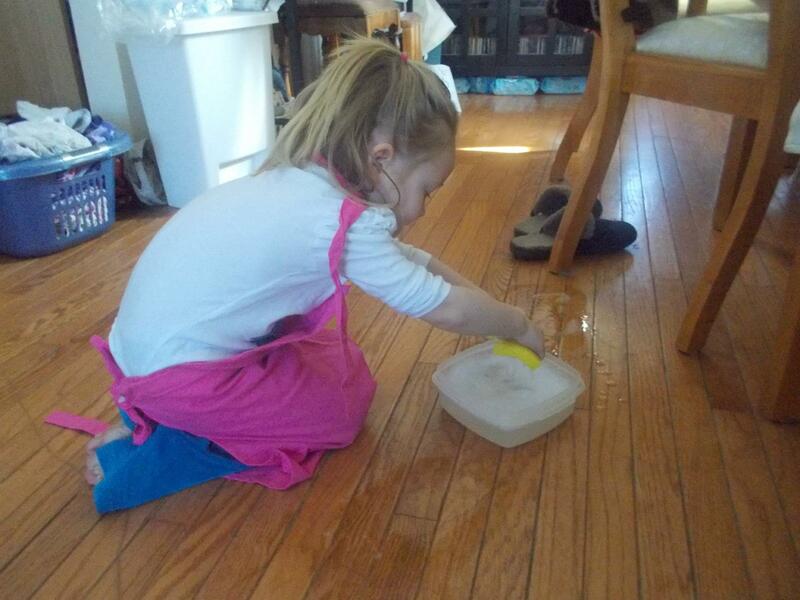 We don’t reward chores in our house anymore, and I’ll tell you why. I’m a lazy homemaker, and so is my husband. We don’t make our bed every day. There are often clothes on the dresser or the floor. (I call it my wear-again pile.) Our shoes may clutter up the entry way. I can’t ask my children to maintain a level of tidiness that is greater than our example. But when we’re put into a time-crunch (dinner guests or friends coming over) we all pull together and tidy up quickly and efficiently. My girls are now of an age that they understand how a household runs. If we don’t do the laundry, we don’t have clean clothes. Same for the dishes. The chores are just a part of life and if we choose not to do them there are consequences. Completing chores is it’s own reward. I would love for someone to pay me after I put away all the laundry, or when I get the dishwasher filled and turned on, but in real life that doesn’t happen. So we don’t reward chores that are necessary to keep a household running. The girls know if their clothes don’t get in the hamper, they don’t get washed. And if I step on a toy on the floor, it gets thrown out (or so they think!) These are natural consequences when you don’t look after your stuff, and your household. If they do something great – like sorting through toys and choosing some to give away – they do get a reward. We hold a yard sale and they get to keep what they make, or we donate the stuff and get an ice cream on the way home. Raising my daughters to understand real life consequences is more important to me than making sure they make their bed. In our busy lives we do what we need to do to keep the household running fairly smoothly. Homework takes precedence over any chores or household jobs. And we try hard to give the kids unstructured play time most days, which to me is also more important than folding laundry. My kids also know when I’m at my wits end. They can tell when I’m about to blow my top because I knocked over that pile of laundry in Emma’s room for the 5th time today. Sometimes they offer to help me out, which is a reward for me. It also shows me that they know how to take some responsibility for the running of the home. The girls often rally as a team and I’ve been known to reward chores with a kiss and high praise when they do something before I ask for the 18th time. Do you have a chore system that works in your home? I like the idea of real-life rewards and consequences. If the girls wear something inappropriate to school (after we have a conversation about it at home first) I like that they get talked to there – or get blisters because they really shouldn’t have worn those shoes. Let me know – in the comments – how you encourage your kids to help out around the house. I’m always looking for other (non reward based) tips for getting the girls to help out! We don’t reward for chores either, for the same reason. I tell the kids we are all part of the team, and being a good team member means pitching in to make the house run better. They get a small allowance every week which is not dependent on them doing chores. If they refuse to do their chores (sometimes happens) they get a consequence they won’t like, usually having to do more chores! LOL I’m a jerk mama. Like you, I do pay extra if it’s a big job over and above what I would expect a kid to do for a chore, like if a kid hauls in a lot of heavy groceries for me I’ll pay out an extra dollar. We were doing a small allowance as well, but frankly we forget and the kids don’t ask. Instead we started the kids bank accounts so the money they get from birthdays etc. goes right in there (transferred from our account and we spend the physical money.) It’s also how we “pay” them for extra help or whatever else. Emma has already purchased something from her money so it’s a great teaching tool. She sometimes gets mad that Rose has more money until we remind her she already bought someone. It’s so interesting watching them learn! These are excellent points! For the longest time I wondered how do families survive with these rewards in exchange for chores done by kids. Mine are too young at this stage. But when the time comes I intend to make chores about collaboration, appreciation of others contribution and growing to be self sufficient. As you said, the chores are part of life and have to be done. Like brushing teeth! I’m glad to see I’m not the only one who thinks chores are a necessary part of life and not something to be rewarded every time. Self sufficiency is so important! Thanks for the comment Nat! I never did because I believed that my job was to make kids responsible for themselves when they were 18 and that included chores. I never paid a dime because I felt that they helped make the mess or used the plate then they could clean it or don’t complain about the place being messy or bugs coming in the house. Just my view from raising two kids. My husband is a slob, and I’m a mild slob. One of our kids has a total disaster room (which she cleans up after only being asked 2 or 3 times) and the other tries a lot harder to be tidy but has a lot more meltdowns when we ask her to clean up. Genetics are funny things. Thanks for the comment Jeremy! I grew up where you just had to do them…no rewards. Although I did get a small allowance…. But I like your reasoning, because it is part of life! I wasn’t rewarded for chores as a child either. Thanks for the kind words! It’s hard to go back when you’ve begun down this road. Baby steps to go back and help your kids understand taking responsibility for their own happiness (and tidiness!) I hope you succeed! Good job Sarah! I’m not so great at getting my kids to tidy their rooms, but they do help with dishes and living area clean up. I don’t rewards my kids for chores either. They know that if they don’t tidy their room – then they can’t invite any of his friends to come over and play. I am a mean mum! haha lol! Ha ha ha – mean mum! We use “company coming” as motivation to get cleaning as well. Heck, I use it for myself! Thanks for visiting Su! I just started to pay the kids…because I am freaking desperate. Ha ha ha! We used to pay the kids, but stopped as it wasn’t motivating them. Different strokes! You have a great approach to chores and prevent the “way too many toys” phenomenon. I also am amazed at the girls sometimes choose to give away in these circumstances. But I try not to dissuade them – their decisions are just that: theirs! I’m terrible. I clean when someone will see. By which I mean, I tell my husband to clean when someone is coming. I’m not into chores. He’s not thrilled either but he does it to save me. He doesn’t have a great “eye” though, so I go over thigns and tell him what needs to be done. We’re a weird team but it works.